Regular readers of Asian Fashion Blog, and anyone that's ever spoken to me about Asian fashion will know that I love love browsing the online store Pernia's Pop Up Shop and have been itching to buy something from there for ages! This family wedding was the perfect opportunity to make my first purchase and setting myself a budget of £300 I spent hours on the site deciding on what to order when I finally settled on the geometric print collection by SVA which I first blogged about in September last year. 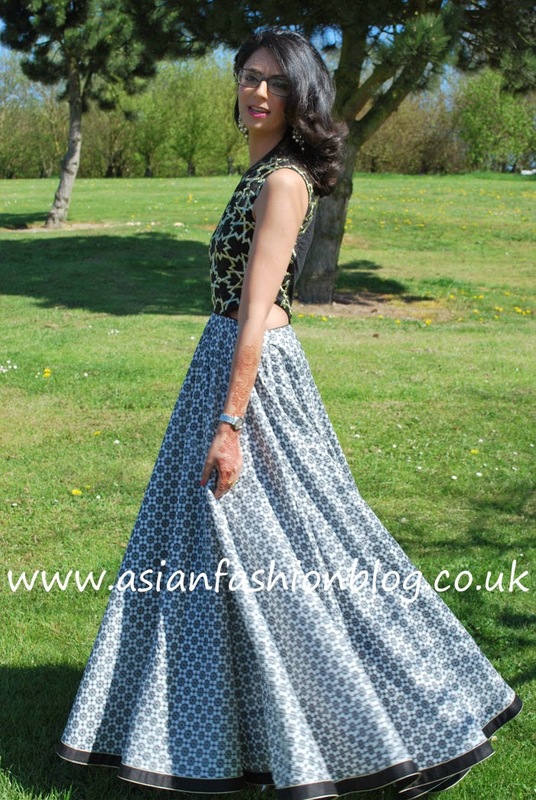 Knowing I was planning to wear a lengha on the mehndi, and had bought a sari for the walima, it was a natural choice to pick one of the anarkali dresses from SVA's collection - plus these were the most affordable for me. This was the dress I picked, at £278 it fit the budget (it's now priced at £286 on the website) and I knew the groom was going to be wearing green so the green dupatta was the perfect colour. I took my measurements and decided to order a size XS; as the dress had cutouts it needed to be a snug fit, even though I was nervous about it being a bit too tight. I signed in and made payment via Paypal on 23rd March - there was no shipping charge, although I was expecting to have to pay customs and import duties on top of the £278 cost. The product page on the website advises "the item will be shipped 2-3 weeks from the date of order placed" and two weeks later on the 6th April I received an email notification from DHL to say my shipment was on its way! The package itself arrived 3 days later on 9th April and I didn't have to pay any addition customs or import charges. The package was a black box, with my dress folded beautifully in Pernias Pop Up Shop tissue paper. I rushed home from work that day and couldn't wait to try the dress on - it fit just right (although the top is very fitted and I needed some assistance when it came to taking it off!). 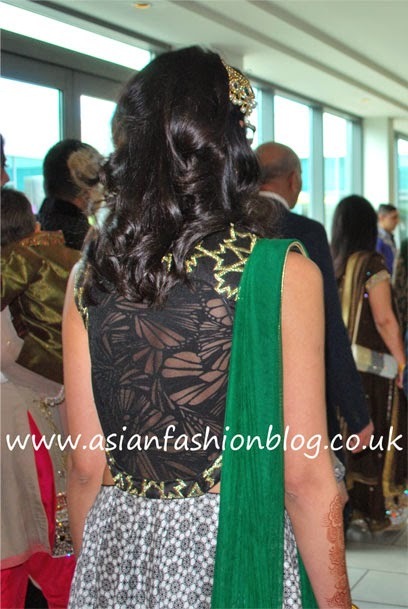 I loved the cutout detail at the sides of the dress, it's a really unique feature which I've only seen on a handful of asian outfits and I knew this would raise a few eyebrows from the more conservative guests at the wedding, but I felt comfortable to show a little skin - some of my sari blouses show more skin than this!! However the website didn't have a photo of the back of the dress and I was surprised to see there was a huge cut-out at the back too - effectively making it backless! 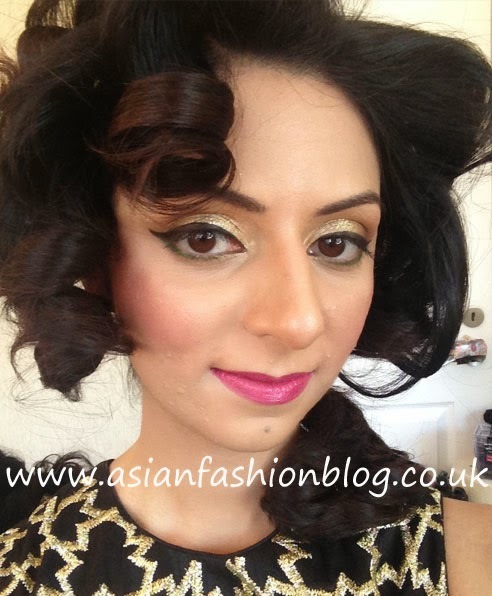 I booked Laila Choudhury to do my make-up on the day (I also used her for the engagement - check out that look here) and we went for gold on the eyes, with a hint of green liner underneath and pink lips! Here's a pic of my make-up, as my hair styling was in progress. I debated over whether to wear contact lenses instead of my glasses; I cut back on my contact lens usage around 2 years ago due to them irritating my eyes, and around that time I bought the glasses which I currently wear. The frames are Chanel and I feel like myself when I'm wearing them, so I decided to ditch the lenses, go for comfort and be "geek chic" on this special occasion. I'm fortunate enough to share jewellery with my sisters and my mum, and this beautiful set from Kyles Collection, belongs to my older sister - she in fact hasn't even had the chance to wear it herself yet! It's actually a bridal set, the Sawana collection, and she ordered it in store last year when her and my mum went on a bit of a shopping spree! 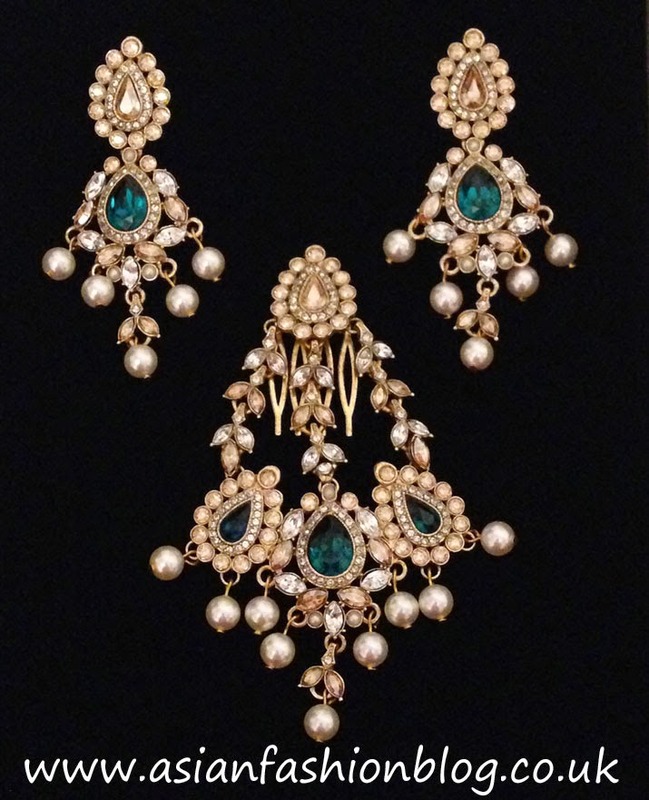 They booked an appointment in advance and spent over an hour choosing the colour combinations for the jewellery sets. At the time, none of us had picked our outfits or colours for the wedding but emerald green and gold is such a classic colour combination, we knew we'd get lots of wear out of this! These pictures were taken during a stop off en route to the wedding, so I'm sans dupatta and necklace, but either way, the outfit looks fab and I was really happy with it. I loved wearing this, it felt light, swishy and I think the cutouts on the sides and contrast between the black/gold top half of the dress and printed bottom half did wonders for my figure! I was also really impressed with the online shopping experience at Pernia's Pop Up Shop, I have a feeling this is going to be the first of many purchases from there! It's gorgeous! Such a great buy, good for you! You look amazing! The outfit's perfect on you. And love that you went with your glasses, comfortable eyes any day! You look amazing Nazma. Great choice, tips and love the finishing touches. I'm sure you stood out from the crowd. I love it!!! Such a lovely shape on you, you pulled it off beautifully! Love the whole look!